Peter O’Toole was one of Hollywood’s most highly regarded actors. He was best known for playing T.E. Lawrence in Lawrence of Arabia. Born in Ireland in 1932, Peter O’Toole was one of Hollywood’s most highly regarded actors. O’Toole’s rise to stardom began in 1962, when he played T.E. Lawrence in Lawrence of Arabia. He went on to appear in such critically heralded films as Becket (1964) and The Lion in Winter (1968), with Richard Burton and Katharine Hepburn, respectively. Later successes include My Favorite Year (1982) and Venus (2006). O’Toole announced his retirement from acting in 2012. After battling a long illness, O’Toole died peacefully at the age of 81 in a London hospital on December 14, 2013. In his early teens, O’Toole left school and ended up working for the Yorkshire Evening Post. He held several positions at the newspaper before deciding against a life in journalism. “I soon found out that, rather than chronicling events, I wanted to be the event,” he said, according to Robert Sellers’s book Hellraisers: The Life and Times of Burton, Harris, O’Toole & Reed. After completing his national service in the Royal Navy, Peter O’Toole won a place at the famed Royal Academy of Dramatic Art. His classmates there included Albert Finney and Alan Bates. O’Toole began his career on the stage with the Bristol Old Vic theater. Before long, he established himself as a gifted actor. O’Toole was especially known for his portrayal of the title character in William Shakespeare’s Hamlet. O’Toole made it to the big screen in 1960, playing small roles in the films The Savage Innocents, Kidnapped and The Day They Robbed the Bank of England. Soon after, the actor signed on for one of the most significant parts of his career: He was hired by director Sir David Lean to play the title character in the drama Lawrence of Arabia (1962). Making this critically praised project proved to be a physically and emotionally grueling process, as it took two years to film and was shot in seven different countries. But O’Toole’s hard work paid off: He was nominated for an Academy Award (best actor) for his portrayal of T.E. Lawrence in the film. Though he didn’t win this honor, the movie took home the Oscar for best picture. With the success of Lawrence of Arabia, O’Toole became an international film star. He picked up his second Oscar nomination for his turn as King Henry II in Becket (1964), in which Richard Burton played the title role. The following year, O’Toole demonstrated his range as an actor with leading roles in Lord Jim, a drama based on the novel of the same name by Joseph Conrad, and the Woody Allen comedy What’s New Pussycat?. In 1968, O’Toole gave a stellar performance opposite Katharine Hepburn in the English historical drama Lion in Winter. He once again played England’s King Henry II in this movie, which earned him another Oscar nod. The following year, O’Toole landed the lead role in a more contemporary yet equally acclaimed film, Goodbye, Mr. Chips, playing a shy teacher who becomes smitten with a showgirl. O’Toole continued to show that he was clearly capable of great transformations on screen with 1972’s The Ruling Class, in which he stars as a mentally disturbed English aristocrat who believes that he is Jesus Christ. In addition to being known as a great actor, O’Toole established a reputation for his heavy drinking around this time. His substance abuse caught up with him in 1975, landing him in the hospital, and he subsequently underwent surgery for what doctors called an abdominal irregularity. The 43-year-old actor nearly died. Soon after, O’Toole decided to put end to his drinking, stating, “The time has come to stop roaming. The pirate ship has berthed. I can still make whoopee, but now I do it sober,” according to the Daily Mail. Before this incident, O’Toole’s career had been a downward spiral. He continued to make some poor choices over the next few years, especially the gory and explicit Roman era flop Caligula. After some delay, the film was finally released in 1980 to scathing reviews. O’Toole managed to overcome his personal challenges to return to top form as an actor. He starred in another Oscar-nominated role, as an egomaniacal director in The Stunt Man (1980), and again won raves for his portrayal of a beloved and wild film star in My Favorite Year (1982). In 2006, O’Toole received his eighth Oscar nomination for his performance in Venus. He plays a mature actor who develops a platonic relationship with a much younger woman in the film. The actor returned to the small screen in 2008, portraying Pope Paul III in The Tudors. 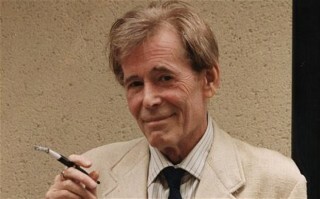 O’Toole died on 14 December 2013 at the Wellington Hospital in London, aged 81.His funeral was held at Golders Green Crematorium in London on 21 December 2013, where he was cremated in a wicker coffin. O’Toole’s remains are planned to be taken back to his birthplace of Connemara, Ireland, his daughter Kate saying, “We’re bringing him home. It’s what he would have wanted.” They are currently being kept at the residence of the President of Ireland, Áras an Uachtaráin, by the current President Michael D. Higgins who is an old friend of the actor. His family plan to return to Ireland to fulfill his wishes and bring them to the west of Ireland when they can. On 18 May 2014 a new prize was launched in memory of Peter O’Toole at the Bristol Old Vic Theatre School; this includes an annual award given to two young actors from the Bristol Old Vic Theatre School, including a professional contract at Bristol Old Vic Theatre. It was performing as part of the Bristol Old Vic at the Theatre Royal in King Street in the 1950s that O’Toole won his early acclaim.